"It was 1990. I was a producer resident at the CFC and had a wonderfulscript written by Paul Quarrington, which the actress Jessica Tandy had read and liked. I needed a director. I went to meet Norman at his office on Gloucester Street. He had read the script and had such insightful things to say. But, he told me that he had his own stories that he wanted to tell and that he needed to stay on top of those. I was so inspired in that first meeting by his candour, commitment and focus. These are just some of the qualities that make Norman a leader and a legend." 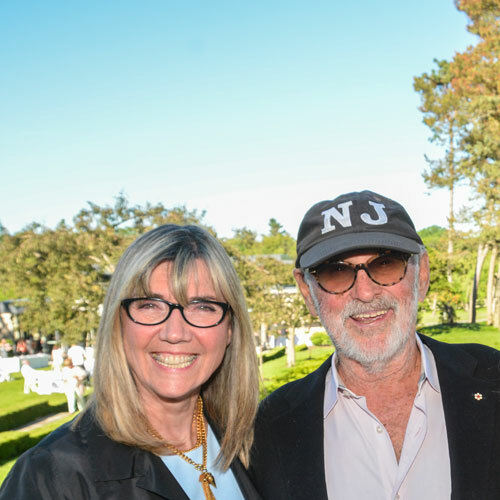 "Norman Jewison’s spirit informs all we do, all we stand for and all we achieve at the CFC. His talent, his grace, his humour and the joy he brings to the creative process inspires all of us. Every organization that is successful needs to be measured against lofty and inspirational goals. Norman has done that for us. And for that reason, all of us at the CFC – past, present and future – continue to aspire to make this organization great in its ability to incite and prepare Canadian talent for successful and creative careers in show business." "My Dinner With Norman would have been a fun book to write had Andre not killed it for me. Friends, laughs, wine – not necessarily in that order – are Norman’s recipe for a fun night. And for me, and my wife, Deb, just being able to call him Norman is something we don’t take lightly. He is a friend who has already ascended to the very top rung of the big time Hollywood showbiz ladder, and yet could not be more Canadian in spite of his success. And that is Norman’s irresistible charm – having such a modest take on such an accomplished life. And I respect that as much as his body of work. To me, Norman is truly an inspiration." "Norman put his full cinema capital on the line in the mid-‘80s, when he decided to implement his dream to establish a centre of excellence for Canadian filmmakers. He was a star, a legend, an icon, but he knew he would still have to enlist business leaders, philanthropists, the Canadian arts establishment, as well as all levels of government, to realize his vision. Gradually, everyone came to Norman’s side – Mel Lastman provided the use of the Windfields Estate as the place, and the Centre lurched into operation in 1988. I remember one close call when Norman, David Galloway and I travelled to Ottawa to solicit the critical financial support of Flora MacDonald, Minister of Communications from 1986 to 1988. When Norman was in full flight and talked about cinema as the literature of our generation, Flora looked up sharply and interrupted him in the scolding tone of a school teacher: 'Oh dear, Norman, I do hope there will still be books.' The meeting ground to a halt for a few seconds, but Norman was unfazed and went on to win her over and save the day for the Centre yet again. Ten years later, we gathered at Windfields to celebrate the Centre's 10th anniversary. It was a dark night and we were all huddled under a tent in a Hollywood rain from one of Norman's movies. There was a candle at each table for light. Norman rose to speak and we fell to silence. Finally, Norman spoke: 'It's about the stories. Our stories. Canadian stories.' It was magic – a beautiful moment that no one who was there will ever forget. Thank you, Norman, for inspiring us and giving us the Canadian Film Centre. We love you. Happy Birthday." It was privilege for me to work with Norman at the outset of the Film Centre. He has made an enormous contribution to the Canadian film industry through the Centre, and Canada is lucky to have him. I am proud to call him my friend." "Norman Jewison is recognized as one of the world’s great filmmakers and of that there is no debate. His films, and the awards they have won, are a timeless testament. I have known Norman for more than 30 years, 13 of which I served as Executive Director of the Canadian Film Centre. Over all those years, I, like so many of his friends and colleagues, have enjoyed and appreciated a lighter, but no less entertaining side of the man – his ability to tell a good story, to regale audiences large and small (often at the Film Centre) with tales of Hollywood celebrities. (If you get the chance, ask him to tell you the story behind him being chosen to direct Fiddler on the Roof.) Less well known and celebrated are his gifts and talents as a teacher to inspire, engage, challenge, motivate and entertain the next generation of Canadian filmmakers. This commitment is embodied by the success of the CFC itself and the achievements of the thousands of graduates working in all corners of the industry across Canada." "I have had the pleasure of knowing Norman for over 25 years and am proud to call him my friend. He is intelligent, funny, principled and kind. I love the ways his eyes crinkle when he laughs and that he laughs so hard he cries. Norman cares – about his family, his friends, his community and the world at large – and he has the courage to speak up when he sees a wrong. His generosity, both in the community and specifically toward the CFC, is boundless. I have watched Norman inspire the next generation of storytellers, who hang on his every word when in his presence. His response to many of the first-year films has often been: 'Too dark, too dark.' Norman sees the world in colour and with joy, and he brings a little of that to every person he touches. "I remember so clearly being a university student and sitting in a movie theatre at the end of A Soldier’s Story, awed at what I had just seen. For the first time as a filmgoer, I clearly understood the role of the director. The vision that Norman had … his deft hand with the actors, the texture he created with the story, the camera, the editing, the score … it was all put together by a filmmaker, a person with creative passion and singular purpose. I finally realized that artists made movies! Of course!! It was a life-changing moment for me."